What to say about this one? Well it is not a great movie... but definitely entertaining on a whole. 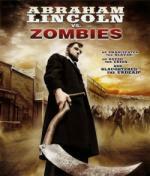 I knew this was a rip off of Abraham Lincoln: Vampire Hunter... and wasn't expecting anything as good here... so that helped my enjoyment level some. I would say this is an average horror film. If you go in not expecting much then you should find it to be worth the time put in to watch it. But that is about as far as I would go. As you can see I am having a little trouble getting into the newest season. This is a movie that for some reason I always enjoyed... ever since I brought it home the very first time... when I rented it on VHS. Wow that was a long time ago. One thing I really liked about this... is you don't have to be a horror fan to enjoy this monster movie. 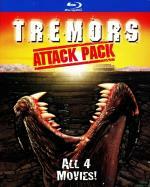 My brother (who is not much of a horror fan at all) loves this series of movies. This is what I personally call a "light horror". 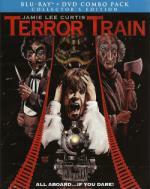 It is a nice mix of horror and comedy. And even now when I watch it (after watching the entire series of Reba) don't recognize Reba McIntyre when she is on the screen... though her voice with her accent is unmistakable. The Blu-ray release I have is pretty decent. It contains all the films and has a nice collection of extras! What more can you ask? Take an excursion into terror with Jamie Lee Curtis in this classic shocker from director Roger Spottiswoode (Tomorrow Never Dies). It's New Year's Eve, and a group of college coeds have planned a masquerade bash aboard a chartered train. What they didn't plan on was that a knife-wielding psycho would crash the party and begin slaughtering the guests one by one! Who is this brutal costumed killer? Could it be the mysterious magician (David Copperfield) with a talent for swordplay...a former frat pledge with an axe to grind...or any number of other guests, both invited and uninvited? Also starring Academy Award®-Winner Ben Johnson (1971, Supporting Actor, The Last Picture Show), Hart Bochner (Die Hard) and D.D. Winters (aka Vanity, 52 Pick-Up). This is one I somehow never seen before... or at least don't remember ever seeing before. It is not a terrible movie... but I definitely seen better. The storyline seemed to be a good idea but they could have followed through better. I found that I didn't care for most the characters as much as I should have and the basic plot I seen many times before. Granted this film is up over 30 years old so this one did it before many of the others. But that is just comes with the fact of not seeing it when it was first released. It is worth the time put in to watch it... but don't expect too much from it. They say, the boy was scared to death. When the death of a child at a boarding school is blamed on a ghost, hoax exposer Florence Cathcart is certain that science and reason can explain it. But the truth she discovers is more terrifying than she could ever imagine, and soon the ghost hunter becomes the hunted. Starring Rebecca Hall (The Town), Dominic West (John Carter) and Imelda Staunton (Harry Potter films), The Awakening is a terrifying mystery filled with haunting twists that will keep you on the edge of your seat. This is one we watched the other day and I forgot to write the review for till now. I found this one to be an entertaining... even if confusing film. It is a good story and has some good atmosphere. And you do leave the film still with some unanswered questions. Though I do wonder if a second viewing wouldn't help with that at least some. It prowls the streets of downtown Chicago – a dark, menacing car with no driver and a mind of its own. it can transform itself into other vehicles where it lures unsuspecting strangers inside and suddenly feeds on their flesh. But when it's towed into an underground garage, the overnight crew of mechanics and secretaries are unexpectedly trapped with a furious four-wheeled – possibly alien – hybrid killing machine that can morph, think and take pleasure in hunting humans. And tonight, its hunger for destruction is about to go into overdrive. ODED FEHR (The Mummy, Resident Evil: Extinction), ADRIEN DORVAL (The Twilight Saga: New Moon), RYAN KENNEDY ("Caprica") and MELANIE PAPALIA ("Painkiller Jane") star in this full-throttle thriller from ERIC VALETTE, the director of Malefique and One Missed Call. 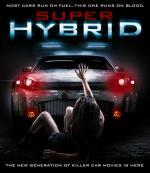 Despite this not being about a possessed car... this one is a blatant rip-off of Stephen King's Christine. But hey... I am a realist. I realize this will happen with any popular storyline. That in of itself doesn't make it a bad film. And while I have seen many better I wouldn't call this one a bad film. It is an entertaining way to waste an hour and a half. Just don't go in expecting a masterpiece. One thing this film got right is making a strong female lead. I always preferred a strong female lead. I mean come on... who wants a female lead that alll she does is scream, whimper, cry, run, fall and die? Give me a woman with some fight to her any day of the week! Anyway... far from a great film but a decent way to waste some time. With only 3 more days left I think I am doing pretty good... right on schedule for movies and one ahead of schedule on TV episodes. I've watched some, but not as many as I had hoped to...or that I have in previous years. and I'm irritated...I can't find Poltergeist. Now I'm thinking a friend borrowed it..just have to remember to ask them about it. Now I'm thinking a friend borrowed it..just have to remember to ask them about it. You know that DVDProfiler has a "Loan-Out"-monitor, do you? I know. I have used it before. Then I stopped..mostly because I didn't remember until later..and I haven't loaned as many movies in the last few years. This was a beautiful, melancholy ghost story. It's an elegant little film, with a wonderful, thick atmosphere filled with grief and guilt. The cast is quite strong in their roles, especially Hall, West and Staunton. It isn't a particularly scary film, but it is haunting. However the film moves at a slow pace, taking its time to develop the story, and while I don't mind that, and think it works well for this story, some viewers might. Also, the ending is somewhat ambiguous, which again, I think works for the story, but some might object. Recommended if you like old-fashioned ghost stories and don't mind the slow pace. This is my second Rolin film (we watched The Iron Rose last year), and I continue to be impressed with his work. This is another beautiful film. It's like visual poetry, dark, romantic, atmospheric. The visuals, as in The Iron Rose, are simply gorgeous at points. There isn't much dialog - large parts of the film are silent, leaving us to the ethereal, lyrical beauty of Rolin's visuals - and the pace is relatively slow. This is horror as art, or art as horror. I can't say I'd recommend it outright. I think Rolin is likely an acquired taste. I've enjoyed both films I've seen of his, and since watching this bought two more (Fascination and The Living Dead Girl), so I definitely enjoy his style, but I don't think it's for everyone. I have to say, however, that the trailer does absolutely no justice to this film. It shows most of a single scene near the end of the film, and gives one a completely different idea about the content of the film. 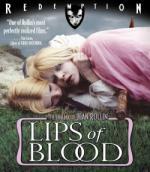 My mom, who had the same opinion of The Iron Rose as I did, was so completely turned off by the trailer that I watched Lips of Blood while she wasn't home. She wants to see it now, though, after I told her about it. Figured I'd go ahead and catch up on my reviews, even though I watched these last month.